In 1928, a bascule bridge with a stone tower at each of it's [sic] four corners was built on this site at a cost of $250,000. The dedication of this structure was held on August 31, 1929, at which time a parade highlighted the festivities, and Governor Walter Kohler made the dedication speech. This bridge served the community without incident until June 25, 1989, when a pivot pin failed sending the 200 ton counterweight and the south span of the bridge into the United States Government Canal. An excursion boat carrying 46 passengers was narrowly missed by the falling bridge. Temporary repairs were made to last until a new four lane [sic] bridge was built in 1993 at a cost of 3.2 million dollars. The dedication ceremony for this new structure was held September 18, 1993 at which time great effort was made to recreate the 1929 dedication ceremony. 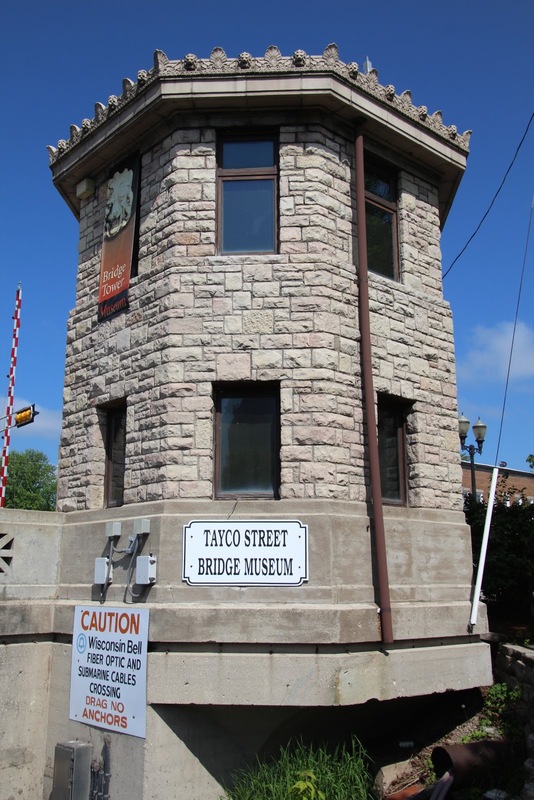 The marker is located adjacent to a parking lot behind the Tayco Street Bridge Tower Museum and is accessible from northbound Tayco Street / Wisconsin Highway 114, at its intersection with Neenah Center, at or near 98 Center Street, Menasha, Wisconsin 54952.